Here are the comic books available in two different formats; in PDF or Issuu. When you click on them please wait because it may take a few moments for them to load, especially the first issue as it is double the size and length of the average issue. 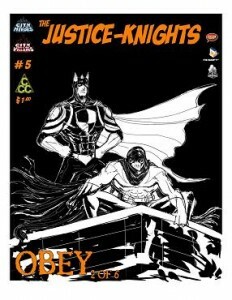 We are introduced to several core members of the Justice-Knights super group as they along with their leader, fall prey to an evil and deadly plan designed to tear them apart. 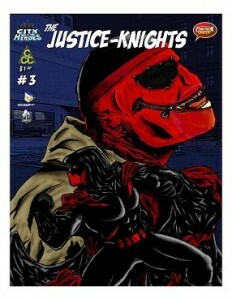 A frantic Spykefury unwantingly gains the help of fellow Justice-Knights Mad Mummy and Patman. Join the sidekick of Sin Stalker, Stalkling, as he tries to figure out the answers to his questions about being a boyfriend, a superhero and an adult. Follow Sister Psyche and Manticore as they uncover something dark hidden within Paragon City. The beginning of the first multi issue story arc. Something strange is going on in Paragon… besides the usual and the only one getting to the bottom of it is Sin Stalker, leader of the Justice-Knights. Only time will tell where his instinct takes him. The second part of the multi-issue story arc heats up as Sin Stalker and his former sidekick Stalkling work against the clock to warn Biosphere of his impending doom. Is Manticore the one truly responsible or is there another at work? The third part of the first multi issue story arc continues as our heroes struggle to survive and find help. Will they find the assistance they need or is a city filled with heroes that are turning against them going to be their final downfall? The fourth part of the first multi issue story arc brings our heroes face to face with a major player in our story as almost all is revealed in this explosive issue. Is this Manticore truly Manticore? What’s CyCorps connection to anything and what truly happened to Sister Psyche and the rest of the Freedom Phalanx, this cities premier hero group? 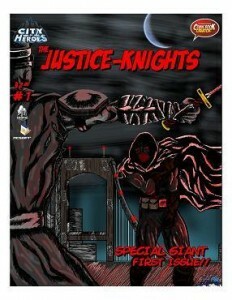 The fifth part of the first multi issue story arc. Like Statesman’s Call several years earlier, Manticore’s Call goes out to the public; asking all citizens and heroes to rally against the evil Cyril Corporation and the Justice-Knights. The stakes continue to increase against the heroes of our story. The end of the first multi-issue story arc. 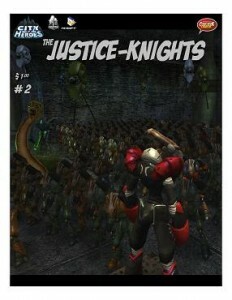 The Justice-Knights are finally together and they have a plan, but will it be enough? With Obedience’s true power yet to be unlocked, can the Knights save the day or will more suffer? Find out. Still healing from their encounter with Obedience, the Justice-Knights are barely holding together as members quit left and right. It is at this time of vulnerability that an old enemy in a new form decides to strike. Rumor has it that CyCorp is about to make the deal of the decade and that doesn’t sit right with some. While most of the Justice-Knights suffer from a communication blackout, Lady Inferus and Dr. Frostburg find themselves on a sinking deathtrap. Under threat of being killed by their own planet’s security forces, Lady Inferus and Dr. Frostburg find themselves trapped, surrounded and hunted all at the same time. Meanwhile the other Justice-Knights, lead by Dark Synaspe, confront the malicious tycoon Mr. Cyril. Prepare for the other side of the downward spiral. 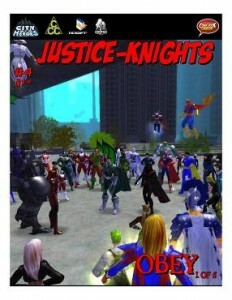 Justice-Knights, Sin Stalker, Stalktress and all characters, places and concepts created by Joseph Brownstone are property of Joseph Brownstone. All other characters, places and concepts are owned by their respective creators and legal holders including but not limited to; NCsoft, Cryptic Studios, Aaron Nellis, David Matthews II. Site powered by WordPress and the amazing highly customizable theme Parabola.